Sen. Theresa Thibodeau, newly appointed senator for District 6, poses for a picture with her family. Kearney Sen. John Lowe and wife Kim. 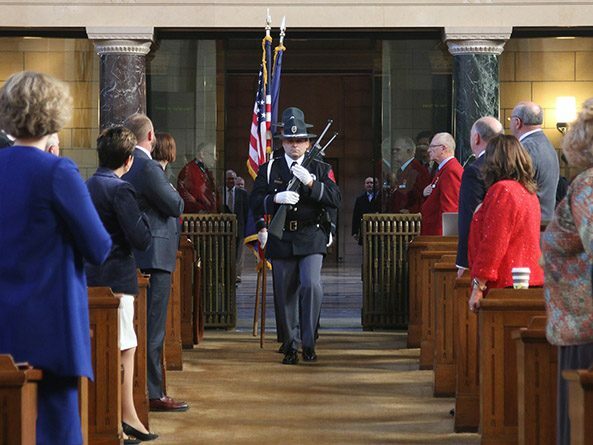 Members of the Nebraska State Patrol served as the honor guard. Lt. Gov. Mike Foley presided over the day’s proceedings. From left: Sens. Bob Krist, Joni Albrecht and Theresa Thibodeau. From left: Sens. Laura Ebke, John McCollister and Adam Morfeld. Sens. Matt Williams (left) and Tom Brewer. Sen. John Murante and daughter. Jim Doggett was sworn in as the Legislature’s chief sergeant-at-arms. Omaha Sen. Robert Hilkemann was elected by the body to serve as chairperson of the Committee on Committees. Speaker Jim Scheer greeted the body. Sen. Carol Blood delivers new bills to be introduced.